This time, Saints were to win the battle but not the war. This time, Saracens were the ones celebrating at the end of another bruising contest. This time, Franklin’s Gardens, not Twickenham, was where the season was to end. 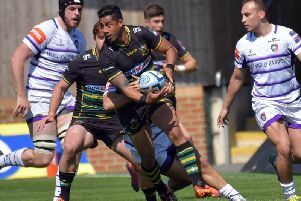 Having topped the regular-season table for the first time in their history, Saints were to fall short in the Aviva Premiership play-offs. Last year, there was a kind of magical momentum that carried Jim Mallinder’s men, who had finished second, past Leicester and Saracens to glory. But this time, Saints’ tag of champions and table-toppers only served to provide added inspiration for a Saracens team who avenged their defeat in last season’s showpiece. Mark McCall’s men, so adept in knock-out situations, put in a performance saturated with blood and sweat to get over the line at the Gardens. Owen Farrell’s 19 points grabbed headlines, but it was the nitty gritty done at the breakdown where Saracens excelled. They were supreme in squeezing penalties out of Saints and the kicking game they are so practised at worked to perfection. At times, Saints tried to meet fire with fire, lofting the ball back to their opponents. But the kick and chase game is not theirs. It is not what they specialise in. That was shown when Exeter, who were the only team to win at the Gardens this season, exploited them back in November. And it was shown again here. Put simply, Saracens were able to call the shots. To play their way and to stop Saints doing what they do so well. Finally, McCall’s side had turned the tide against a Northampton team who have become their nemesis since Saracens’ semi-final win at the Gardens back in 2010. Saints had won three successive league meetings with the Barnet-based team. But it was not to be on this occasion. Saints, so consistent in the league, have lost every knock-out tie they have played this season. They fell at Saracens in the LV= Cup final four, were crushed by Clermont Auvergne in the Champions Cup quarter-finals, and now this. Last season, Saints held their nerve and eventually imposed themselves on the opposition, coming so close to a treble, with only defeat in the LV= Cup final at Exeter preventing it. But this time, cup situations did not prove kind and their execution was not quite there. However, there remains much to be proud of and much to look forward to. A squad that will lose influential figures such as Phil Dowson and Samu Manoa this summer, will be boosted by the arrival of players such a Kieran Brookes and JJ Hanrahan. And the development of young players such as Tom Stephenson and Mike Haywood continues to provide immense promise for the future. Saints have made six successive play-off semi-finals – and you wouldn’t bet against them making it a super seven next season. But for now, it is time for them to take a break. To take positives from a campaign that has provided plenty. From the tantalising win against Leicester Tigers in December to the brilliant victory at Bath in February. There have been plenty of highlights. The war may not have been won, but you can guarantee Saints won’t be laying on the battlefield broken this summer. Because next season it all starts again. And next time, Saints will have the extra artillery needed to mount a renewed charge.